By an arrangement entered into between the County and Burgh authorities, an Act of Parliament was obtained in 1887, under which the County authorities renounced their interest in the old County Buildings in County Square, and they erected the new County Buildings, which contain a County Hall, offices for the County Clerk, Treasurer and Collector, the County Road Clerk, the Justice of Peace Clerk, the Health and Sanitary Department, County Police Office with cells and other requirements, and a Justice of Peace Court Hall. The buildings were completed in 1891, from designs prepared by Mr George Bell, Architect, Glasgow, at a cost of £32,000. On the Frieze there is some fine Sculpture work, executed by Mr Frederick W Pomeroy, R.A., London. The County Hall is large, and finished with great taste. In one of the rooms there is a fine Portrait of Sir Michael R. Shaw Stewart, Bart., the respected Convener of the County, painted by Professor Hubert Herkomer, R.A., London, and one of George, Fourth Earl of Glasgow, painted by Colvin Smith, R.S.A., Edinburgh. 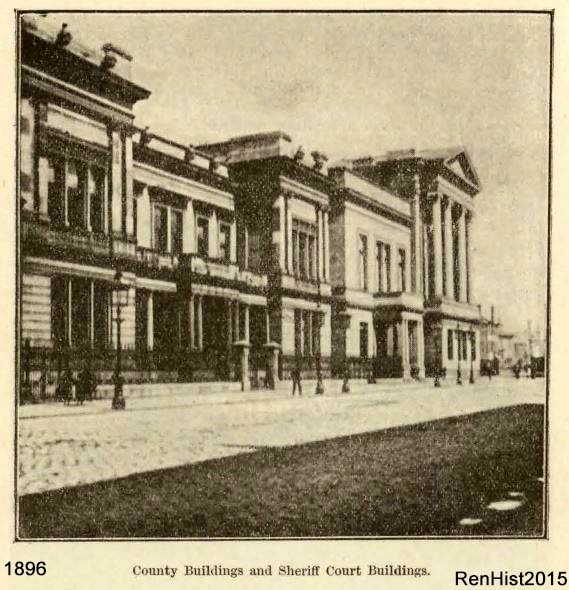 The Sheriff Court Building adjoins the County Buildings on the west. It is in the Italian style, and was completed in 1885, at a cost of £22,000, from designs prepared by Mr Bell, Architect of the County Buildings. It contains a large and commodious Court Hall with accessories, and rooms for the Sheriff and Sheriff-Substitute, and offices for the Sheriff-Clerk and Procurator-Fiscal, and a Library for the Procurators.